SQUAN Acquires Communications Specialists, Inc.
ENGLEWOOD, NJ--(Marketwired - Jul 18, 2017) - SQUAN, a leading telecommunications infrastructure service provider, today announces the acquisition of Communications Specialists, Inc. (CSI). In acquiring CSI, SQUAN adds geography and a broader services base to support its existing clients, while welcoming those long-forged relationships CSI adds. CSI is a leader in aerial and underground fiber construction services for the telecommunications and cable TV industry, with a focus on services in support of large and small-scale projects for Multiple Services Operators (MSOs), Internet Services Providers (ISPs) and wireless network operators. SQUAN has been aggressively pursuing the expansion of services in support of a long-term view of Smart City development and all roads that lead to the development and operation of heterogeneous networks. In seeking a premier builder of fiber cable and copper solutions to further realize this vision, it became clear to SQUAN that CSI fulfills a critical element of its overarching strategy. "CSI stands out as leader in quality and is a growing provider of services that are highly complementary to the current business in which SQUAN is engaged," states Duane Albro, Chief Executive Officer, SQUAN. "We see tremendous long-term value by incorporating these synergies. Our combined companies will leverage cross-functional skills across each of our service lines as we layer new skills onto our ever-expanding geographical footprint." 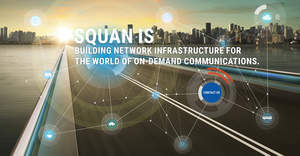 "We share SQUAN's vision of becoming a complete end-to-end network infrastructure provider," states Ken Stabler, CEO, CSI. "Together, we form a world-class company providing leading-edge solutions with an emphasis on quality and safety for our customers." In the coming months, the CSI brand will transition to SQUAN Fiber Infrastructure Solutions. This division of SQUAN will continue to function from its main office in Fishkill, NY. Ken Stabler will continue to lead this organization as its president and will report to SQUAN CEO, Duane Albro. SQUAN has already begun layering skilled personnel and supporting construction assets across its growing footprint. SQUAN provides innovative services for the evolution of telecommunications networks. The company is focused on creating high-value and quality based solutions for network deployment of emerging technologies. More than 400 skilled employees support client projects working from locations in New York City; New Jersey; New York State; DC Metro; Atlanta; Tampa; Miami; Monroe, LA; Conway, AR; and Centennial, CO. Our Engineers, Project Managers and Field Personnel are expertly trained to support wireline, wireless, cable and enterprise markets. For more information on SQUAN, please visit www.squan.com.